So though MILLION DOLLAR BABY might be misconstrued as a “boxing movie” it is miles above the usual formulaic slugfest precisely because it is NOT. From stories by F.X. Toole (Rope Burns), screenplayed by Paul Haggis (CRASH, 2005) and produced and directed by Philo Beddoe himself, MILLION DOLLAR BABY is so rife with themes, it is altogether two good movies mashed together to make one great movie. MOVIE NUMBER 1 (Cue Introspective Voiceover: “Boxing is about respect – getting it for yourself and taking it away from the other guy”): Maggie, a female boxer over 30 (which is apparently gettin’ too old to be in the bashing-people-to-a-pulp biz), is so determined to have facial reconstruction surgery (i.e. 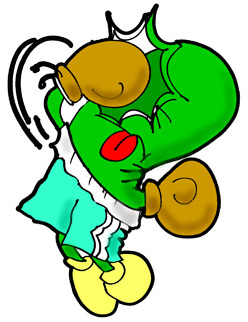 be a professional boxer) that she badgers Frankie to unlock her natural talent. Under his begrudging tutelage she makes it into the big ring, only to become the victim of an opponent’s dirty trick that leaves her paralyzed. MOVIE NUMBER 2 (Introspective Voiceover: “Sometimes you gotta step back to make a punch – but step back too far, you ain’t fightin’ at all…”): paralyzed Maggie fights for her right to make decisions over her own life or death. In all his movies, he’s been a warrior; in MILLION DOLLAR BABY, Clint steps back from The Warrior to be a trainer of warriors. Frankie Dunn resembles one of Eastwood’s other memorable characters, Josey Wales – a loner with an extended family: his gym charges, his priest (whom he visits every day “to wind up”) and Scrap. So when Maggie’s boxing opponent steps across a subtle line and becomes her assailant, is it really any wonder? Boxers are wired antagonistic. Or they’re not winners. Fact: Maggie is wired that way too. She just keeps it suppressed better than the woman painted as the Villain here. As we move into the disturbing hospital scenes, the filmmakers show us that fighting doesn’t have to be about hitting and hurting. Maggie’s family come swaggering straight out of the pages of You Might Be A Redneck magazine – and in her motionlessness, she must fight them trying to legally steal her wealth; she must fight the hospital for the right to make decisions on her remaining life; she must fight her very condition, her only ally being Frankie, as an unconsummated and dire love develops between them that transcends her immobility. Yet we are also aware of Frankie’s all-consuming guilt in his motivation for caring for Maggie: he never wanted to train her in the first place, and now having brought her into the boxing arena, he is simultaneously responsible for her dreams being fulfilled and killed. Cinematography by Tom Stern – beautiful ochre darkness; not since Gordon Willis (THE GODFATHER series) has anyone been daring enough to utilize such stark shadows and blacks. And for good reason. 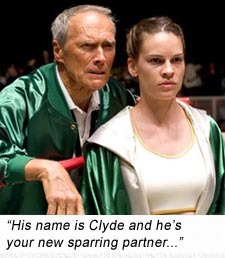 MILLION DOLLAR BABY rolls toward an almost unbearable tragedy, which harkens back to Dr. Kevorkian explaining the distinction between “causing death” and “ending suffering.” Eastwood once again displays his cinematic bravery in tackling this story at all, and leaves enough ambiguity to keep Christ-ies at bay. And that’s a right turn, Clyde. Echoing the stark lighting, the naked emotion, the sparse joy, Eastwood composes the simple music theme – single guitar or piano notes – matching his straightforward directorial style, lean and expedient; making him more of an auteur than he already is. Any which way you try to escape its affecting thrall, MILLION DOLLAR BABY will hit you like a Philo Beddoe roundhouse. Writers: F.X. Toole, Paul Haggis. Starring: Clint Eastwood, Morgan Freeman, Hilary Swank, Jay Baruchel, Mike Colter, Lucia Rijker, Brian F. O’Byrne, Anthony Mackie, Margo Martindale, Riki Lindhome, Michael Peña.